Hemophilia A is a bleeding disease caused by deficiency or defect of a protein called blood coagulation factor VIII. Since 1992 recombinant factor VIII product was introduced, the periodical (very frequent) supplement of this protein by injection through vein has been a major therapeutic approach. Our research focuses on the development of new factor VIII product which has better activity. Consequently the frequency of injection as well as a risk of heavy bleeding incident would be reduced. Hemophilia A patients are usually a boy. Less injection would be very helpful to ease them. I started my career as a pathologist and obtained a training of cell biology and protein chemistry. I have been working on current study for 8 years. Hironao Wakabayashi earned M.D. after 6 year education at Fukushima Medical School in Japan on 1988. In the Department of Pathology (II) at Fukushima Medical School he enrolled Ph.D. program. He studied on cancer invasion and metastasis and earned Ph.D. at 1992. He obtained postdoctoral training at University of Texas MD Anderson Cancer Center in Huston working on the same subject until he had an appointment as a Research Assistant Professor at The Institute for Molecular Medicine at Irvine, CA on 1996. Since 1999 he has been working as a Research Assistant Professor in the Department of Biochemistry and Biophysics at University of Rochester studying on the structural and functional analyses of blood coagulation factor VIII. Factor VIII functions as a cofactor for the serine protease factor IXa in the surface-dependent conversion of zymogen factor X to the serine protease, factor Xa. Deficiency of factor VIII activity results in a marked reduction of factor IXa activity and in the subsequent rates of factor Xa generated during the propagation phase of coagulation. My research focuses on the role of metal ions for structural integrity and function of factor VIII. Active factor VIII can be reconstituted by combining the isolated subunits in the presence of Ca2+ or Mn2+. Ca2+ had little effect on inter-subunit affinity yet converted the inactive dimer to an active form. Alternatively, Cu2+ enhanced the inter-subunit affinity ~100-fold but yielded a dimer lacking cofactor activity. Site-directed mutagenesis is employed to identify residues important in Ca2+ binding to factor VIII and resultant effects of this binding on activity. Several acidic amino acids within segment 110-126 of the A1 domain of factor VIII that likely participate in the coordination of Ca2+ necessary for generation of maximal cofactor specific activity. Wakabayashi, H., Zhou, Q., Varfaj, F., and Fay, P. J.
A3 Domain Residue Glu1829 Contributes to A2 Subunit Retention in Factor VIIIa J. Thromb. Haemost., in press. Varfaj, F., Neuberg, J., Jenkins, P. V., Wakabayashi, H., and Fay, P. J. Role of P1 Arg in Activated Protein C - Catalyzed Inactivation of Factor VIIIa. Biochemical J. 396, 355-362, 2006. Wakabayashi, H., Zhou, Q., Nogami#, K., Ansong, C., Varfaj, F., Miles, S., and Fay, P. J.
pH-dependent association of factor VIII chains: Enhancement of affinity at physiological pH by Cu2+. Biochim. Biophys. Acta 1764,1094-1101, 2006. Nogami, K., Zhou, Q., Myles, T., Leung, L. L. , Wakabayashi, H., and Fay, P. J.
Exosite-interactive Regions in the A1 and A2 Domains of Factor VIII Facilitate Thrombin-catalyzed Cleavage of Heavy Chain. J. Biol. Chem. 280, 18476-18487, 2005. 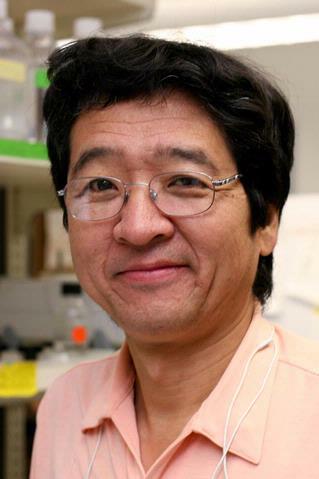 Nogami, K., Zhou, Q., Wakabayashi, H., and Fay, P. J. Thrombin-catalyzed activation of factor VIII with His substituted for Arg372 at the P1 site. Wakabayashi, H., Su, Y. C. , Ahmad, S. S. , Walsh, P. N. , and Fay, P. J. A Glu113Ala Mutation within a Factor VIII Ca(2+)-Binding Site Enhances Cofactor Interactions in Factor Xase. Nogami, K., Wakabayashi, H., Ansong, C., and Fay, P. J. Localization of a pH-dependent, A2 subunit-interactive surface within the factor VIIIa A1 subunit. Biochim. Biophys. Acta 1701, 25-35, 2004. Nogami, K., Freas, J., Manithody, C., Wakabayashi, H., Rezaie, A. R. , and Fay, P. J.
Mechanisms of interactions of factor X and factor Xa with the acidic region in the factor VIII A1 domain. J. Biol. Chem. 279, 33104-33113, 2004. Nogami K., Lapan K.A., Zhou Q., Wakabayashi H., and Fay P.J. Identification of a Factor Xa-interactive Site within Residues 337-372 of the Factor VIII Heavy Chain. J. Biol. Chem. 279, 15763-15771, 2004. Wakabayashi H., Freas J., Zhou Q., and Fay P.J. Residues 110-126 in the A1 domain of factor VIII contain a Ca2+ binding site required for cofactor activity. J. Biol. Chem. 279, 12677-12684, 2004. Wakabayashi H., Zhen Z., Schmidt K.M., and Fay P.J. Mn2+ binding to factor VIII Subunits and its effect on cofactor activity. Wakabayashi H., Schmidt K.M., and Fay P.J. Ca2+ binding to both the heavy and light chains of factor VIII is required for cofactor activity. Wakabayashi H., Koszelak M., Mastri, M., and Fay P.J Metal-ion independent factor VIII subunit association and the role of calcium and copper for its affinity and activity. 1992-1996 Postdoctoral Fellow, Department of Tumor Biology The University of Texas M. D. Anderson Cancer Center, Houston, Texas, U.S.A. Author List: Wakabayashi, H. and Nicolson G. L.
Chapter Title: Determination of invasive ability into Matrigel or Collagen.